Rick Danzl/The News-Gazette Runners in the Illinois Marathon pass Memorial Stadium near the starf of the race Saturday April 30, 2011. 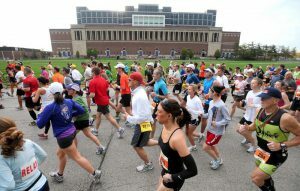 The Fifth Annual Christie Clinic Illinois Marathon is coming to the Champaign-Urbana area on Saturday, April 27, 2013. The marathon will start at 7:00am near Assembly Hall. The course will travel through Urbana, parts of the U of I campus, and Champaign, before looping back to finish at the 50 yard line of Memorial Stadium. Registration closes on April 15, so if you haven’t already signed up, now would be a great time to do so before all of the spots are gone. A map of the marathon route can be found here. Race participants will travel past Stone Creek Golf Course, Meadowbrook Park, Illini Grove, Champaign Country Club, Centennial Park, and other locations in town. The Atkins Group will be sponsoring mile marker 6 along Stone Creek Blvd. in Urbana. Join us for entertainment and to cheer on the runners! Just blocks from the marathon route in Urbana, you’ll find The Pines at Stone Creek, which has a variety of restaurant choices for hungry spectators, including Subway, Milo’s, Cafe Zojo, Wines at the Pines, and Monical’s. For more details about the race, visit the Illinois Marathon homepage.